PRISONERS were held in solitary confinement for months and even years in Northern Ireland’s top security Maghaberry Prison – despite a call from United Nations’ inspectors for a worldwide ban on more than 15 days. Figures obtained by The Detail show that last year at least ten prisoners were held in solitary confinement in Maghaberry for over 100 days each, with four inmates held for over a year and in one case a prisoner was held for five years. 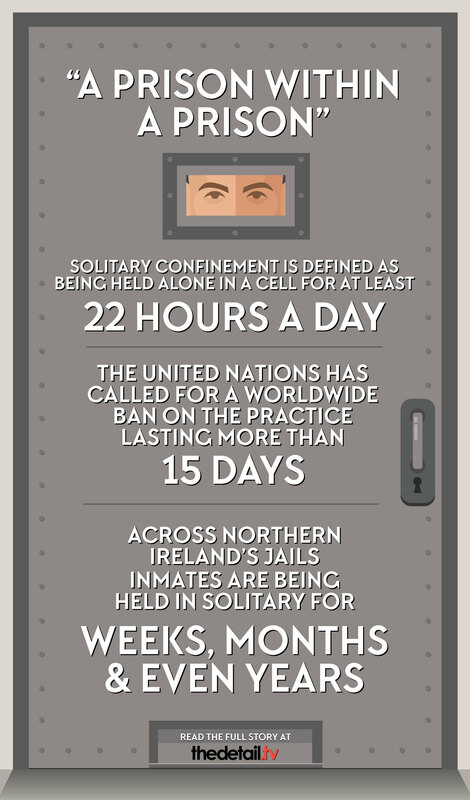 The United Nations considers solitary confinement as the physical isolation of individuals who are in their cells for over 22 hours a day and it has called for a worldwide ban on durations of over 15 days. In Northern Ireland prisoners can be sent to solitary confinement for a number of reasons including as disciplinary action for breaking prison rules or for their own protection when they are deemed to be at risk in the normal prison population. 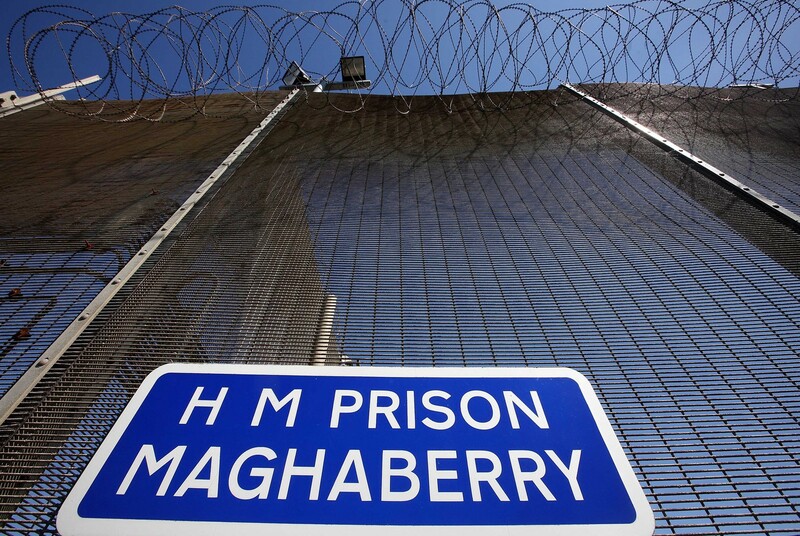 Reacting to The Detail’s findings, the Prisoner Ombudsman Tom McGonigle raised concerns that inmates with complex mental health needs are among those being held long term in solitary confinement within Maghaberry prison. Mr McGonigle said: “These figures are particularly worrying because a lot of prisoners who end up in confinement are already damaged emotionally and psychologically before they go into prison. “Often that leads to the misbehaviour that brings them into solitary and inevitably it becomes a vicious circle whereby their negative behaviour is reinforced by the time they spend there. A separate prison oversight body has also today called for the creation of a mental health facility within Maghaberry to deal with some prisoners who might otherwise be sent to solitary confinement. A spokesperson for the Independent Monitoring Board said: "It is not acceptable in 2016 that prisoners in Northern Ireland are being kept in solitary confinement for such periods of time." Each of Northern Ireland's three prison sites showed use of long-term solitary confinement in their Care and Supervision Units (CSU). The Detail sought to compare the solitary confinement levels with those in the Republic of Ireland (ROI). Monthly figures from the Irish Prison Service show a decrease of 211 prisoners on 22/23 hour lock up in July 2013 to 74 prisoners in July 2016. However, officials failed to respond to our request to release information on how long prisoners are spending in solitary. Director of campaign group the Irish Penal Reform Trust (IPRT) Deirdre Malone said: “The published statistics in the Republic of Ireland do not tell us how long each of those prisoners actually spend in solitary confinement overall nor how often they are returned to solitary confinement as the periods may be simply renewed. The Detail has also interviewed one prisoner who spent five years in Maghaberry Prison’s solitary confinement wing who said he experienced 23 hour lock up on a daily basis. In Northern Ireland prisoners are held in solitary confinement conditions in what is known as the Care and Supervision Unit (CSU). There is a CSU within each of Northern Ireland’s three prison sites. Rules state that a prisoner’s continued stay in the CSU must be reviewed at least every 28 days, but there is no restriction on the maximum length of time an inmate can be held there. The Detail previously reported on a case from February 2012 where an inmate was left severely brain damaged after hanging himself in Maghaberry Prison’s CSU. Click here to read this story in full. The Northern Ireland Prison Service (NIPS) disputes the use of the term 'solitary confinement' to describe the CSU. It said that inmates have daily access to showers, a telephone and can spend up to an hour in a small exercise yard or small gym. A spokesperson for NIPS said: "Every case is considered on an independent basis. Prisoners are only held in the CSU for such a time as is considered absolutely necessary." However, Northern Ireland’s Prisoner Ombudsman Tom McGonigle said: “The Care and Supervision Unit was formerly known as the segregation block, and prisoners call it ‘the boards’, but they know what it is. I know what it is. It’s solitary confinement for up to 23 hours a day. Through a series of Freedom of Information requests The Detail obtained a breakdown of the top ten longest stays in the CSU across each of Northern Ireland’s prisons. 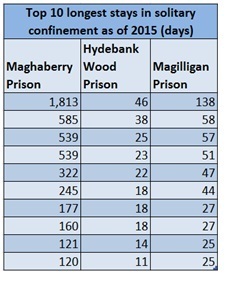 The figures show that since 2011 the longest stay by an inmate in Magilligan Prison’s CSU was 138 days. The longest stay in the CSU in Hydebank Wood prison site - where female prisoners and the young offenders centre are based - was 46 days. The longest single stay for an inmate in Maghaberry Prison’s CSU was five years. A breakdown of the top ten longest stays in Maghaberry’s CSU as of 2015 showed that several prisoners had been there for six months while others had been there for a year and a half. Each prison in Northern Ireland has an Independent Monitoring Board (IMB) made up of volunteers who report on prison conditions on an annual basis. They are also notified every time a prisoner’s period within the CSU is extended.We also have a breakdown of the number of times prisoners were sent to the CSU. Last year in Maghaberry Prison one inmate was sent to the CSU on 44 separate occasions. Prisoners can be sent to the CSU under two main prison rules. The first allows an inmate to be held in the CSU for 48 hours. The second allows the prisoner to be sent to the CSU for up to 72 hours, but this can be extended to a maximum of 28 days before it must be reviewed again. The decision to extend a prisoner's time within the CSU beyond 28 days is taken by prison authorities and will also be considered by an official from the Department of Justice. The Independent Monitoring Board must also be notified of any extension of a prisoner’s time in the CSU. We asked the IMB for a response to our solitary confinement figures. A spokesperson said: “It is not acceptable in 2016 that prisoners in Northern Ireland are being kept in solitary confinement for such periods of time as highlighted by The Detail today. Unfortunately we have been aware of this problem for some time and have continually raised it with prison authorities and the South Eastern Health Trust. “Our role is to monitor not manage, but under the current system we are only told about a prisoner entering the CSU when they are due for their first review. "A PRISON WITHIN A PRISON"
Since 2008 all prison healthcare has been the responsibility of the South Eastern Health and Social Care Trust. In a statement to The Detail the South Eastern Trust said the location of prisoners within prisons is the responsibility of the Northern Ireland Prison Service. A spokesperson said: “All individuals located within the Care and Supervision Unit are seen daily by healthcare professionals in relation to both their physical and mental health care needs. Trust mental health professionals initiate referral processes to secure psychiatric facilities where this is clinically appropriate and in line with regional referral criteria. In 2012 an enhanced healthcare landing in Maghaberry prison was closed, though some mental health and clinical addiction services were retained. The Detail recently reported that ambulances were called to Northern Ireland’s prisons over 1,100 times in the last three years. This works out at an average of one ambulance call out per day for a total prison population of around 1,800 people. Prisoners’ psychiatric conditions, addictions and personality disorders have been a common thread in critical reports into prison life and individual incidents in jails in Northern Ireland in recent years, including suicides. Click here to read The Detail’s previous coverage. The Prisoner Ombudsman said that it was important to remember that the Northern Ireland Prison Service dealt with inmates who could present very challenging behaviour and often had complex mental health needs. Mr McGonigle said: “Very often those prisoners who end up in the CSU are inmates who fall between several stools. These are people whose mental condition is not deemed as such that they require transfer to a secure psychiatric facility, but they have been sent to prison by a criminal court and have to be managed somewhere to keep themselves, other prisoners and staff as safe as possible. “It's not good for anybody's mental health to spend so much time in isolation away from general population. Prison restricts the opportunities to interact with normal society in any event, so the CSU is essentially a prison within a prison. In Northern Ireland, an individual cannot be detained and treated against their will in a psychiatric hospital if their only condition is a personality disorder. This is likely to change with the recently enacted Mental Capacity Act (NI) 2016, which will allow for the compulsory treatment and/or detention of people with personality disorder, although a date for commencement of the Act has not been agreed by Stormont. The Ombudsman said he believed this was having an impact on vulnerable inmates entering the prison system who can often end up in solitary confinement. He said: “It really is a societal issue whereby we need to decide how we treat those very damaged people who commit offences. For example many of those prisoners who end up in the CSU can have personality disorders, but in Northern Ireland a personality disorder is not defined as a treatable condition. A review of mental health and the criminal justice system in Northern Ireland from March 2010 recommended an assessment of the need for a local high security hospital to which the most dangerous mentally disordered prisoners could be transferred for medical treatment. A spokesperson for the Independent Monitoring Board said: “We have stressed the need for an inpatient healthcare facility within Maghaberry as at the moment the prison does not have a functioning hospital wing. “We would recommend that one of the houses within the site be converted into a secure healthcare unit with an emphasis on prisoners with serious mental health issues to be staffed by prison officers who are specifically trained along with mental health nurses, psychiatrists and other medical professionals. In a statement the South Eastern Trust said: “We are commissioned to provide a Primary Care and Community Mental Health model of service provision on an equitable basis to that provided within the community. Prisoner Ombudsman Tom McGonigle said that the inmates held in solitary can include those with mental health issues, plus prisoners found to be at risk in the general prison population, but that some of those held for the longest terms in the CSU can be inmates jailed for paramilitary offences who might otherwise be held in separate loyalist or republican landings. Prison authorities declined a request by The Detail to view Maghaberry’s CSU stating that it would not be possible as the normal location was under refurbishment. In an effort to find out more about conditions in the unit we interviewed Gavin Coyle who was convicted for offences linked to dissident republican activity and spent five years in Maghaberry prison’s solitary confinement wing. The 38-year-old from Omagh was given a 10-year sentence, five of which were spent in jail, after admitting possession of arms and explosives and membership of the dissident organisation calling itself the New IRA. While in prison he was also charged with the attempted murder of a police officer in Castlederg in May 2008. Prior to his release from jail earlier this year, he spent five years in Maghaberry’s CSU under 23 hour a day lock up, despite a high profile campaign by his family to get him moved to Roe House where separated republican prisoners are held. His family had publicly rejected claims by the Northern Ireland Office that he would be “under threat” if he was transferred to Roe House. In an interview with The Detail, Gavin Coyle said: “Speaking about this publicly is not about republican propaganda on my behalf, it’s about highlighting what the CSU is like and highlighting the 23 hour lock up issue. He added: “The only time I had the opportunity to see daylight when I was in the CSU was the one hour a day in the yard, but it’s that small that all you could actually do is walk around in circles. While his five year period in the CSU was the longest revealed in the data, the figures showed many inmates across Northern Ireland’s three prisons were held in solitary confinement for long periods. Last November the Criminal Justice Inspectorate (CJI), which has responsibility for reporting on prison standards, published one of its most critical reports on Maghaberry Prison. Inspectors said a few longer-stay prisoners could sometimes meet together for limited periods of association following risk assessments but that “at best, prisoners remained locked in their cells for at least 22 hours a day”. Prison inspectors have repeatedly raised concerns about the mental health needs and “psychological deterioration” of some prisoners within Maghaberry’s CSU. Due to the refurbishment a separate CSU has been temporarily established in Foyle House within the prison grounds. However a follow up inspection by CJI in January this year said that, while it was positive that a major refurbishment of the CSU had begun, inspectors still felt that “conditions in some cells in the temporary unit were grim”. Last week the head of the Northern Ireland Prison Service announced that she would be stepping down in October. Sue McAllister was appointed director general in 2012 and became the first woman to hold the most senior position within a Prison Service in the UK.